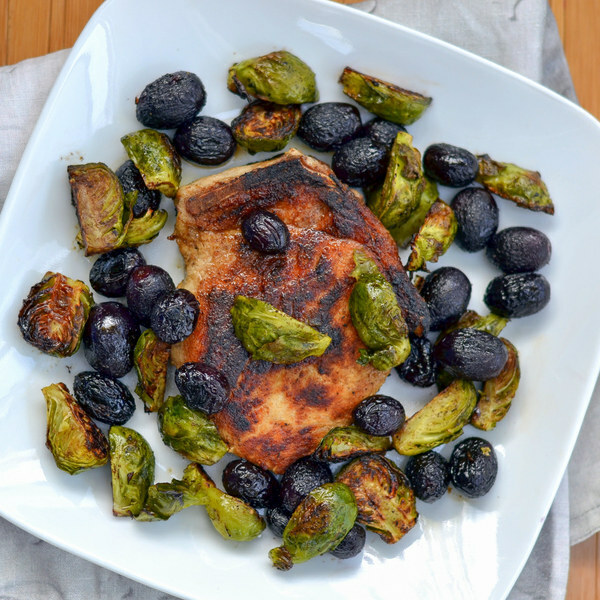 ← Dijon Pork Chops with Roasted Brussels Sprouts & Grapes. Wash brussels sprouts and grapes. Trim ends and halve the brussels sprouts. Pick grapes off the stems. Transfer to a sheet pan. Drizzle with oil and season with thyme, salt, and pepper. Toss to coat. Place in the oven and roast until browned and tender, 20 minutes. In a medium bowl, whisk together Dijon, vinegar, maple syrup, thyme, salt, and pepper. Add pork chops to marinade and toss to coat. Coat bottom of skillet with oil. Add pork chops and cook until cooked through, 3-5 minutes per side, depending on thickness. Spoon any remaining marinade over top while cooking. Remove sheet from oven, drizzle brussels sprouts and grapes with vinegar, and toss to coat. To serve, place pork chops, brussels sprouts, and grapes on a plate. Enjoy!